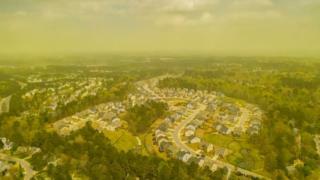 A thick haze of yellow pollen has blanketed the sky across parts of the south-eastern US, with reports of spring allergy symptoms on the rise. One particularly dense cloud of pollen was photographed in Raleigh, North Carolina. A video of pollen erupting from a falling tree in Hixson, Tennessee, has been widely shared on social media. The high pollen levels have brought on the traditional itchy, watery eyes and sneezing. "In April in North Carolina we have an overlap for a couple weeks where we have pretty high counts of tree and then grass also gets started," Dr Heather Gutekunst, of Allergy Partners of Raleigh, told ABC11. Pollen is made up of fine, microscopic grains released into the air by grass, plants and trees. They are carried on the wind, are easily inhaled by humans and pets and they stick to everything. Pollen season comes in three waves. Tree pollen season typically covers early to late spring. Grass pollen season follows, before weeds release irritants later in the year. On a typical high pollen count day - dry, warm and sunny - the first half of the morning and later in the afternoon until late evening are the times to avoid being outside. Pollen experts say it is advisable to shower and wash your hair and clothes at home after being outside and take medication if necessary.